Ruffle lichen, Parmotrema hypotropum, is a large foliose lichen that is common on twigs and trunks of hardwood trees in open places. Look for a light gray color, and upturned lobes with long eyelash-like cilia. Reproduction is by soredia that occur in powdery linear masses (soralia) along the margins of the lobes. The undersurface is dark except near the margins, where there is a broad light band. 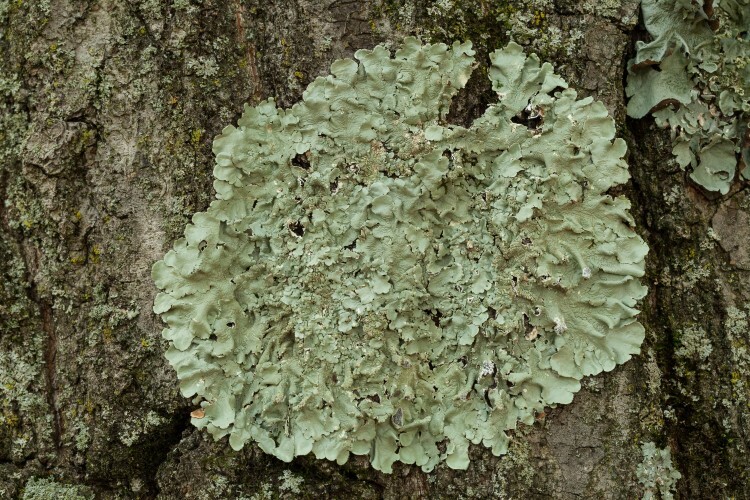 Common greenshield is a large foliose lichen that grows on bark. 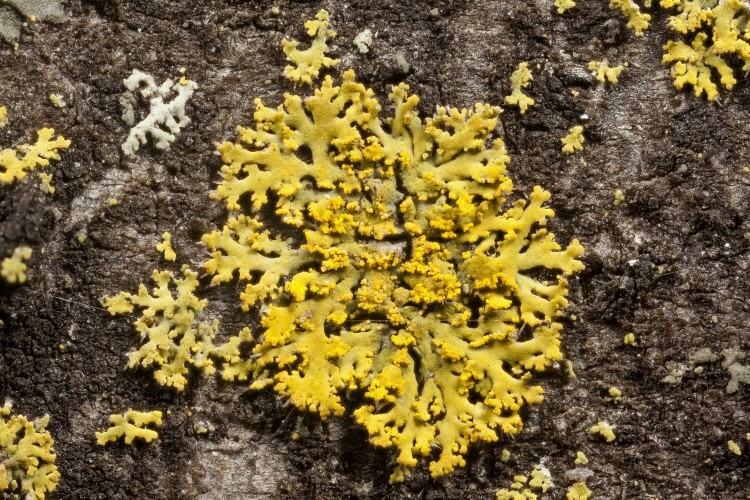 It’s easy to spot by color alone as is is a distinctive yellow-green, not the plain gray of most other lichens seen alongside it. Reproduction is by soredia, produced in powdery masses on the upper surface. 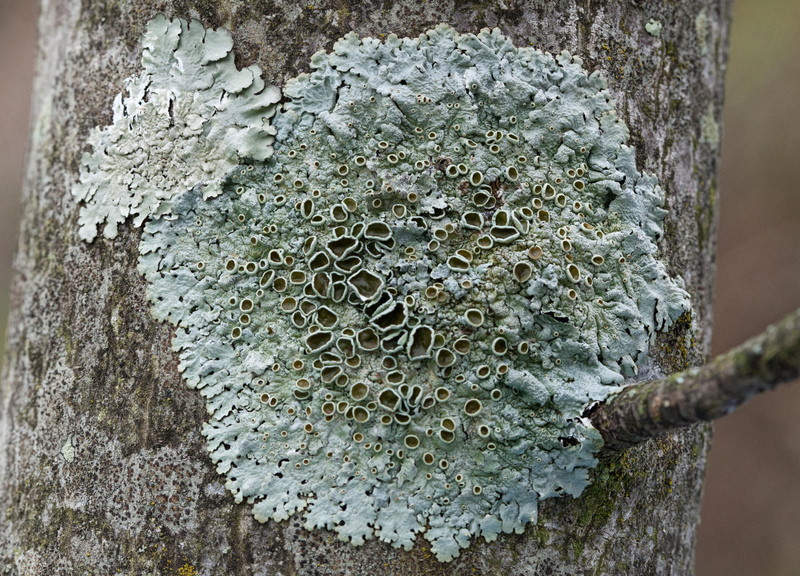 Rough speckled shield lichen is a medium-sized foliose lichen that is extremely common on trees. The genus Punctelia is characterized by minute (use a hand lens) openings in the upper cortex (pseudocyphellae) appearing as whitish specks. The species P. rudecta reproduces by isidia, and these presence of these structures help separate it from another common local species (P. subrudecta) which is sorediate. Rough speckled shield lichen, Punctelia rudecta. 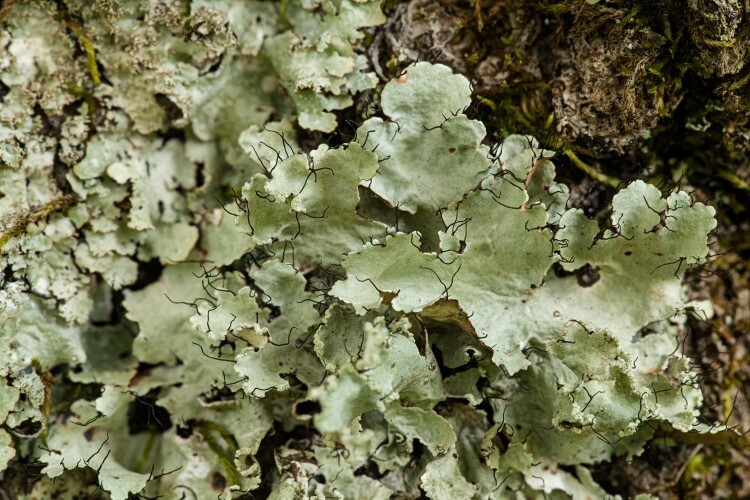 British soldiers is a very popular lichen, and perhaps the only North American species with a well-known common name. 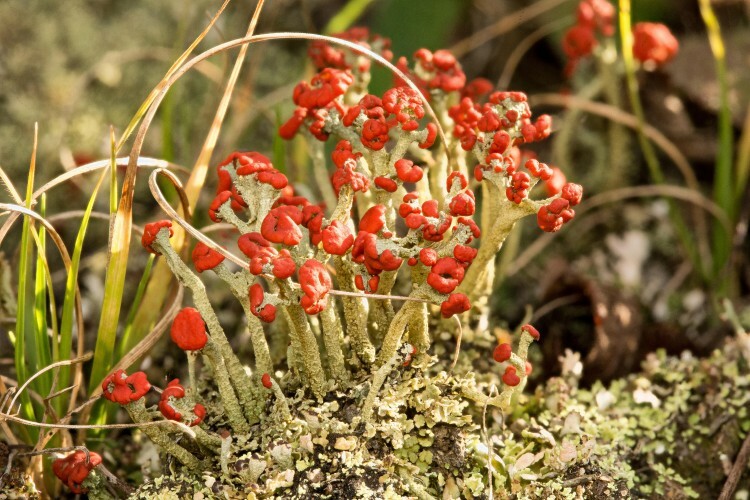 It is a typical “cladoniform” lichen, i,e, a fruticose lichen that consists of two parts: a primary thallus which is the first thing to grow and is usually crustose or formed by numerous small plates called squamules, later followed by an upright structure called a podetium. In some cladoniform lichens, including this one, the podetia are tipped with apothecia (the “soldier’s” red “hats”). It grows on the ground or wood in open areas. 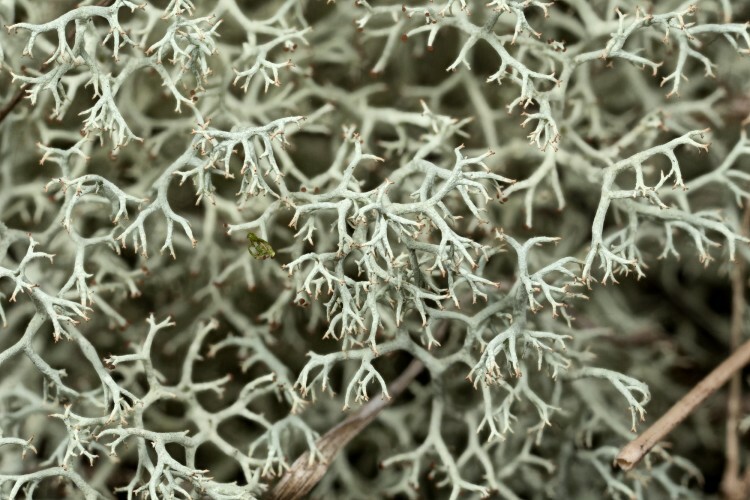 Dixie reindeer lichen is one of several tangled fruticose lichens that are completely smooth (lacking the little squamules on the podetia that characterize many-forked reindeer lichen). The branches usually end in twos, and the overall color a has a yellowish cast. have podetia terminating in cups. 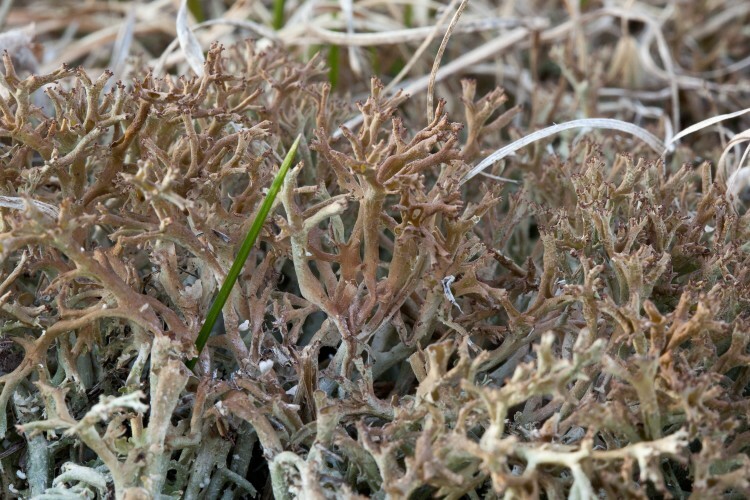 Dixie reindeer lichen is common on the ground in dry open areas. 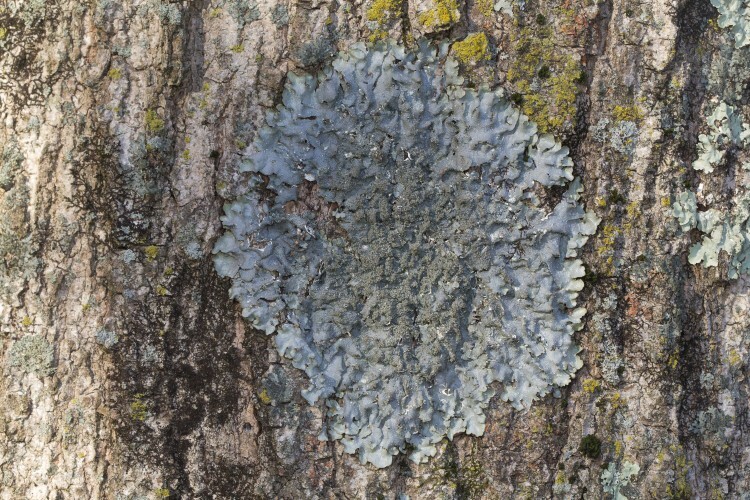 Smooth axil-bristle is a light gray, medium-sized foliose lichen that is common on tree trunks and twigs on open areas. It doesn’t have any evident means of asexual reproduction (neither isidia nor soredia), but it abundantly produces apothecia. The medulla is a pale yellow, and the apothecia are deeply concave and have a shiny brown inner surface. THE LICHENS ARE A FASCINATING SHOW!